This guest blog comes from Jon Roberts again; doctoral student from Kings College London and Wellcome Genome Campus. See Jon’s research here. As a genetic counsellor one of the most difficult questions I faced in clinic was from parents asking: “how do we talk about the genetic condition in our family with our children?” Talking about a genetic condition in the family can be very challenging. Below I offer some ideas about how such conversations could potentially be made easier by using fiction. Specifically using Harry Potter. I present these ideas as ones that you, as a parent, you can look and decide if they would work with your family or not. First, I wish to talk about how Harry Potter can be used to help explain concepts of inheritance. Harry Potter is full of examples of familial inheritance. For example, if you have magical parents you are likely to have magical children. This is not always the case though, as sometimes non-magical parents can have magical children. We see this with Hermione who has non-magical (muggle) parents. There are other examples of inheritance in the books. Hagrid is so big because his mother was a giant and Harry Potter is said to look exactly like his father, except that he has his mother’s eyes. There is the potential for these parts of the story to help explain some specific genetic facts. This can be done of a very broad level. For example, with recessive conditions (such as cystic fibrosis) it can be hard to understand how a child can be affected with a condition even if their parents are not. Harry Potter, can help by showing children they are already familiar with this concept – non-magical parents can have magical children. The books can also help explain other things seen in families with genetic conditions, such as why some people are more severally affected than others. This is similar to the Dumbledore brothers, Albbus and Aberforth. Both the Dumbledore brothers are wizards, yet Albus is by far the more powerful. Talking about concepts of inheritance can be difficult, especially when this involves lots of new ideas and language. I would advocate using ideas from Harry Potter to explore with children what they currently know about inheritance. This can be used as a base with which to discuss more ‘scientific’ concepts of inheritance, using their own knowledge and reference points as the basis for a conversation. One of the challenges with genetic conditions is that they can make someone feel different. Medical language does not always help. We talk about ‘mutations’ and try to find out if genetic variants are ‘pathogenic’ or not. Discussing the emotional implications of a genetic condition with children can be a real challenge. This can be in part because the desire to be ‘normal’ and like everyone else can be very powerful for children. Discussing genetic testing can potentially make children feel different and as such can be very distressing. The Harry Potter books also contain a range of characters that are made to feel different in some way. As such these characters are ones that children with a genetic condition could potentially identify. Harry, for example, is physically marked out by a scare on his forehead. Like some physical traits in genetic conditions, this outward characteristic is both a symbol of Harry’s difference and one that can cause him pain. Another example is Remus Lupin, who is different because he is a werewolf. As such he is often discriminated against in the Wizarding world. The important thing about Lupin’s ‘difference’ is that it goes unseen most of the time, that is to say, you could not tell he was a werewolf just by looking at him. It is only at particular times (i.e. a full moon) when Lupin transforms, experiencing both fear and the loss of control. There is an analogy here to some genetic conditions that have no obvious outward signs. As such, they are only visible at certain times, such as when someone has to go into hospital or they become ill. The fear and lack of control that people often feel at these times is similar to that which Lupin experiences when becoming a werewolf. I have discussed two examples of how Harry Potter could be useful in discussing genetics with children. The above examples are not meant to be prescriptive ‘how to’ guides. Instead, they are ideas that you might find helpful in a when thinking about how to have an on-going discussion with your children about a genetic condition that is in the family. 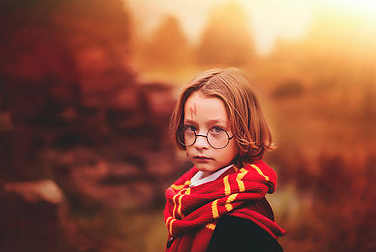 I have used Harry Potter as an example partly because if think it is a rich source of powerful characters and imagery, but also because it is popular and as such children are likely to bring their own knowledge and passion to the conversation. I think if children are allowed to bring their own opinions and ideas and have these respected, this allows for the conversation to flow and communication to be facilitated. Jon Roberts is conducting research into popular film and family communication about genomics; you are very welcome to see his research and complete his survey on your experience of film and genetics here.